There’s a multitude of Apple Watch articles out there. Everything from focusing way too much on the $10,000 anomaly that is the Apple Watch Edition, to obsessing over the fashion element, to discussing the range of bands and their combination, to articles that question the mere existence of such a device. Today, I thought I’d focus on the useful aspects of Apple Watch. Specifically, how it would be useful for me. The guy who’s not a well off American – clearly out of Apple Watch’s key demographic. During both Apple Watch keynotes, there was little I could relate to. I don’t take coast to coast flights every weekend that would be made easier thanks to Apple Watch. It won’t help me avoid all human interaction when it comes to booking a hotel room (that one I’m actually sad about). I don’t have the automation system in place to unlock my garage door from the Watch (damn). Also, no Apple Pay here in India. But as a regular, iPhone touting individual, there are some use cases for Apple Watch that get me excited. I’m not a… fit guy. And I know, thinking Apple Watch is going to change any of that is foolish of me. But I do think it will make things easier. Or at least get the geek in me excited about fitness. First, it will tap me on the wrist every 20 minutes while at the desk, telling me I need to stand up and move around. Also, according to the keynote video, the Watch will basically be my personal trainer when (and if) I work out. That means telling me how many reps I’ve done or telling me stats about my run on the treadmill or the elliptical. Having that data then synced to the Health app is going to be much better (and hopefully more accurate) than the heads-up displays at the gym. We’ve yet to see the practical implications of always having a heart rate monitor with you, but I think that can be game changing. Also, how terrifying would it be if the Watch played that Enrique song every time it measured your heartbeat? Ugh, yet another screen that will give me a panic attack when I get a call. But as it turns out, the Watch is going to be smart about this. Notifications will only show up if you’re actually wearing it. The Watch has a Taptic Engine. It generates a feeling similar to being tapped on the wrist. If this actually works, I’m going to try and make the Watch my only notification space. No loud notification sounds going off on Mac, iPhone, and iPad at the same time. Just a gentle tap from the Apple Watch. Glances is a mix of notifications and widgets. Using Glances I can get quick updates on all my favorite apps. To-dos, Twitter updates, weather, and more. I want the Apple Watch to be an always on remote control for every kind of media consumption. This means controlling music that’s playing on my iPhone (or Mac), controlling podcasts when I’m cycling (Pocket Casts, don’t disappoint me on this one) and when I’m watching movies and TV Shows on my PC. The last one is a biggie. I’ve gone through so many remote control clients for all kinds of media apps, but they’re still a bit too complicated to use. Also, they’re far away, on my phone. My watch is right there, on me. So please, developers, make a VLC/Plex/XBMC controller app for me. And you can have my 99 cents. Or multiples thereof. This might sound silly to you, the American Airlines frequent flyer that can use Apple Pay, but I’m genuinely excited about Shazam being on Apple Watch. I can’t remember how many times I’ve let a song go unshazam’d because I was too lazy to get my phone out and open the app and do the scan. Another crazy thing? The Shazam app will also show the lyrics for the song right there on the Apple Watch. That’s right, no more mumbling the really fast parts of Eminem songs in public for me. Evernote has already updated their app with Apple Watch support and this is of the features. I’ll be able to dictate a note to Evernote, have it transcribed by the app and added as text to a new note. No more forgetting the next million dollar idea because I was too lazy to pick up the phone for me! And if Evernote is able to do this, I’m sure others will come up with more powerful alternatives. Maybe the Workflow app will let me append a piece of text to the end of a note instead of making a new one. Maybe. 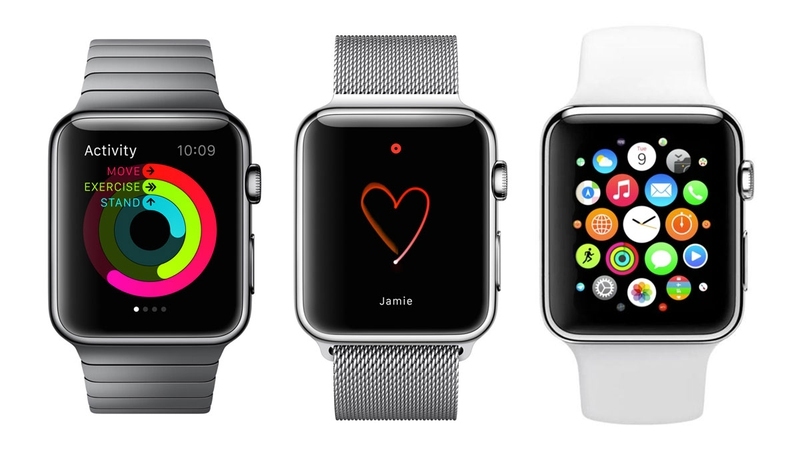 I’m not sold on the sending heartbeat, drawing a message, and the cute stickers part of Apple Watch. Also, I’ll need to use the Crown before passing judgement. The battery life. If this thing dies by the evening, it’s of no use. Apple is claiming 18 hours of average use, but we have no idea how that translates to real-life use. Starting at $349 for 38 MM and $399 for 42 MM, they’re definitely expensive. You’ll need a pro/cons chart to justify that cost. And that’s just for the basic Watch Sport model. We’re not even talking about the stainless steel Apple Watch and the choice of bands.